I expect that it's no surprise to my readers, and anyone looking at my site, that I am a bit of a cleaning freak. This, I blame on my first part time job while at High school. It was for a couple who owned a motel, which had a lot of fishing boat workers stay, a port town you see. So you can imagine the state the rooms would get in. Mrs Owner was a very particular cleaner and taught me how to really clean....."it's all about the detail my dear". However we always had an arsenal of high powered cleaning products so that's what I learnt to use. It was not really until about 12 months ago that I awoke to the toxic elements in my cleaners!!!. That had to change! I use the general cleaner for all surfaces including mirror and glass, also it's my floor cleaner. It is very effective, just spray it on the surface, but don`t over apply, wait for a few seconds (which apparently you should do with all cleaners) and just wipe off. I use a damp or dry cloth, just depends on the situation. As an example every night after tea I have a kitchen cleaning routine where I just use my general cleaner and a damp cloth to clean all the surfaces, sink, microwave, hob area, fridge and coffee machine. Then for glass and mirrors I use a dry cloth with the general cleaner. The scourer I use for scrubbing the kitchen sink, showers and bathroom sinks once a week. I sprinkle it over the area then spray the general cleaner on it a bit as the Vinegar in it helps "activate" it. Then just get a scrubbing brush and scrub away. It's not hard work with a brush and only takes a couple of minutes. The tap cleaner is used on....you guessed it the taps. I just spray on after cleaning the sinks and surfaces then use the toothbrush to get into joins etc on the taps. You see this is all about the details here folks!!! I also use the Deodoriser spray for scent and not as a cleaner. So I only use it after all the surfaces are cleaned. I tend to only use on desk and table tops as it leaves a lovely smell. My two products that I buy are the toilet cleaner and Polishing Oil. I use the polishing oil once a month on my wooden furniture as it provides moisture and seems to reduce the dust build up. It has linseed oil in it which is why it's so good. Also as a handy hint it is great on stainless steel. I have used it for years on all stainless surfaces in the kitchen, including the fridge, it's great and it's cheap and you can get it at any supermarket and online at CO Products. Now I only essentially use two products made from two ingredients which I buy from Figgy & Co online. OMG the savings. I can not believe how much you save. 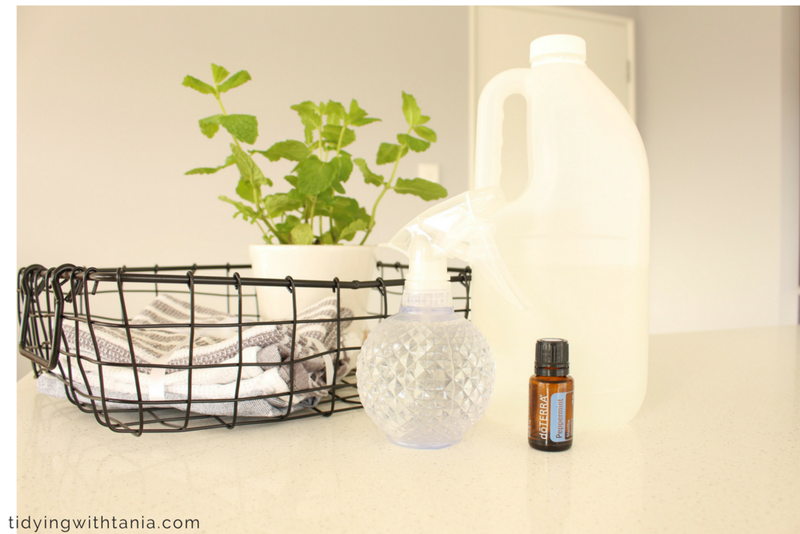 There some great natural cleaners that you can buy if you don`t want to make your own. I would look at Eco Store . They have great cleaning products that are made here in NZ and are certainly chemical free and have a lot less impact on the environment. They have a great Website and online shop. Also check out Figgy & Co fantastic products made by two talented women and made here in NZ too, they are a newer company so would appreciate the support and they are also online. Plus they have a free recipe booklet that you can get to make your own products...fab really. All good tradies have great tools. I am still perfecting mine, well mainly the scrubbing brush as I am still to find a good one and not a cheap plastic number! The tools I find really helpful are toothbrushes, good scrubbing brush and window wiper. I came across this great idea of using toothbrushes from a Youtube channel, At Home with Nikki. These are great for cleaning in those hard to reach places. Facecloths are my cleaning rag of choice, these are easily reused over and over again. I just soak mine in Eco Store stain remover and hot water before throwing them in the wash.
For my windows, inside and out, I simply use a bucket of warm water, a cloth (old cotton tea towel) and the window wiper. No streaks, just beautiful clear and clean windows. Another couple of helpful tools are Blind cleaner and Lint roller. These I do get from the $2 shops however they are reusable so not too wasteful. The Blind cleaner is essential if you have venetian blinds, just pop them in the wash afterwards and good to go again. The Lint roller is perfect for getting dust off surfaces like Lamp shades, duvets, decorative pillows, also really helpful when ironing (well that's if anyone Irons anymore?) It's certainly better than wrapping inside out cellotape around your fingers. Lastly in my kit I have a couple of reusable microfiber cloths that attach to a duster and a floor cleaner. This is all I use to clean the floors and dust weekly, quick and easy. A one stop shop was essential for my kit. I wanted a container that I was able to pick up and take around the house. It actually took me a while to find one, I did not think it would be such a hard job. I eventually found one big enough to store what I needed and easy to take with me. This one at Bunnings is similar to what I have, again it's not expensive. As a final note I do try and make my cleaning kit "pretty", what I mean by that is to coordinate my colours in my products and tools. I know that sounds stupid but let's face it cleaning is a job we all avoid. So why not make it more enjoyable, by having a kit that is nice to look at, you never know, it might make you a bit more motivated. I would love to hear what's in your kit, have you got any Grandma remedies that work wonders?